Around since 2009 and causing much transformation in the finance industry, blockchain technology and its progeny bitcoin are booming. Renowned celebrities such as Richard Branson, the Winklevoss twins, Ashton Kutcher, Mike Tyson, and company Overstock.com are all Bitcoin investors, believing in its potential and its future as a transformer of global payment methods. For the ones who haven’t been keeping up with the modern times, bitcoin is decentralized virtual currency. Needing no central repository and having no single administrator, it uses a technology called the blockchain to process all transactions swiftly and publicly. In other words, it’s a new and efficient method of conducting business internationally. So, it’s new and it’s big. But how can it actually benefit you as a creative business? 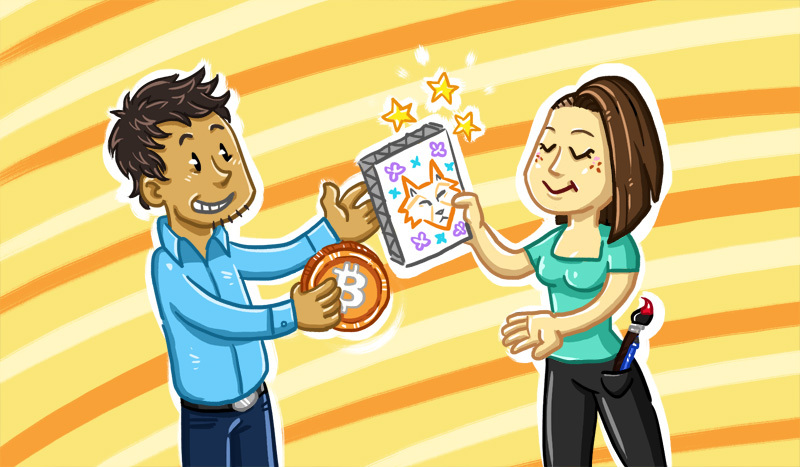 Accepting Bitcoins as a self-employed creative has several advantages. First of all, as of 2015, trading bitcoins is currently free as long as the transaction is over 0.01 BTC. Whether it’s receiving payments through Bitpay or moving bitcoins from a wallet to another, there is usually no fee associated to doing such transfers. The Whys and Hows of the lack of fees and when fees are applicable is explained and illustrated more clearly on this website. When we look at traditional banking however, most banks charge a monthly maintenance fee, and even Paypal charges its merchants a 2.9% + $0.30 per sale. For international transactions, bitcoin also alleviates the heavy fees which apply to wire transfers. Doing business in bitcoin is also pretty quick; transactions take as little as 10 minutes to be processed (that’s how long it takes to mine a block of encrypted information, and to confirm the transaction). While some services may take longer to verify the transaction, withholding the newly received bitcoins for a bit longer before you can send them or transfer them to a bank account, in my experience, the funds are always available within a day. Bitcoin, like all other currencies, is subject to value fluctuation. If you are unsure what this means and if economics is not your strong suit, the situation can be summed up as the following: the more people invest in bitcoin, the higher its value; the opposite is also true. Therefore, the value of a single bitcoin could pass from $230 USD to $240 USD, or $220 USD in the same week. As a professional, if a client pays you 1 bitcoin for services rendered one day, you may find yourself with a bit more or a bit less money if you wait too long before converting it into dollars, as the value of most major currencies usually fluctuating less drastically (unless you live in a country on the verge of or going through recession). The only real negative consequence of accepting bitcoin is therefore its value fluctuation which is more rapid than most other currencies. Assuming you charge in your native currency, get paid in bitcoins and finally convert the bitcoins to your native currency as soon as you receive them, there should be little to no issue at all. Waiting several days or weeks before “cashing in” could result in gains or losses. There is no harm in doing this if you enjoy the risks of gambling with your money. While there are several services you can use to accept bitcoins, after doing my own research, I found the easiest to maneuver is Bitpay, a free, trustworthy and popular Bitcoin service reminiscent of Paypal. It does not require the creation of a Bitcoin wallet, and is therefore ideal if you only want to accept payments that you will immediately transfer to your main bank account. The first step is to open up a Bitpay account here. After entering your legal information, you will be asked to enter your business information; business name, physical address and business owner’s name. Entering this basic information will allow you to receive $100 daily and $500 annually. Unless you do one or two Bitcoin transactions per year, you’re probably going to want a higher limit. To apply for a higher volume, you will have to go to Settings > Approved Volume. Tier 1 will allow for up to $1000 daily and $10 000 annually, which is great for a small business dipping its toes in the bitcoin pond! Bitpay does require certain information such as a link to a live website featuring your products and services which will be manually reviewed before approval is granted. Tier 2 will allow for up to $10 000 daily and $500 000 annually, but does require incorporation documents. If you are not incorporated, this could be an issue. That being said, if you earn more than $10 000 annually in Bitcoins alone, I think it will be a fun problem to have! Just go incorporate already! The last step to accepting bitcoin payments will be entering your bank account information as well as your Bitcoin wallet address if you have one and wish to keep your payments in bitcoins for an extended period of time (see the last segment of this article for information on bitcoin wallets). Accessing bank account information can be done by going to Settings > Settlement. 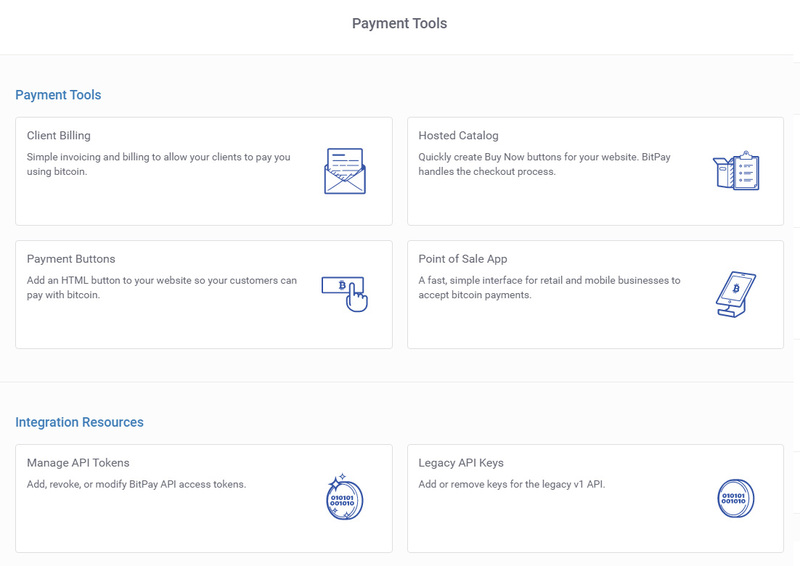 Finally, Bitpay’s Payment Tools will enable you to easily create invoices with Client Billing, as well as Payment Buttons which can then be added to your website. While the payment will be processed in bitcoins, you may choose to charge your clients in dollars, euros or any other currency handled by Bitpay. Once your client pays you, you will receive an email notification confirming the reception of the payment. Then, the newly received funds will be automatically transferred to your bank account or to your bitcoin wallet according to your preferences. You should now advertise that you accept bitcoins for your creative services; very few of us illustrators, designers, writers and developers accept bitcoin payments at this time, and it may give you an edge in attracting new clients who conduct business primarily in bitcoin. You’re welcome. Some of you may choose to keep their earnings in bitcoins instead of immediately transferring them to your bank account. That’s not a bad idea, but in order to do so you will need to create what is called a bitcoin Wallet. There are two types of wallets: True wallets will store bitcoin information on your hard drive and function with a software that uses a secret key, akin to a password, to move your bitcoins. The bitcoins are yours and safe as long as you remember your secret key. Should you forget it, you will lose access to your hard-earned funds forever. And needless to say that if someone finds your secret key, or if your computer gets hacked, you may lose your bitcoins. Thankfully, there are extra security measures which can help you prevent this type of theft. There are also online services which can act as a wallet on behalf of users, just like banks managing their clients’ funds for them. While those are very easy to setup, the companies providing this service are not responsible for account theft and fraud, which renders them less secure than using a traditional wallet. A list of popular true wallets and wallet services can be found here. For security reasons, I will not display publicly my choice of wallet, but I will strongly encourage that you, as a serious business owner and professional, do your homework and investigate the different options concerning wallet and theft prevention in order to make an informed choice. The bitcoin industry is a young one and although it is definitely worth exploring, one must use caution when venturing in new territory. It’s the Wild West out there, a promise for a better, brighter future, but there are bandits hiding behind the bushes. Make sure you come well prepared and you could just hit the jackpot! This article hopefully covers the basics of setting yourself up to receive bitcoin payments as a creative. If you’ve got questions, comments or stories to share with us, I invite you to leave a comment below. Cheers!